Tampa Bay model portfolio photography for modeling. "My portfolio pictures that I got from Aurora PhotoArts really work, and I am now booking more work than I ever have before! My portfolio really shows the variety of looks that I have as a model, and the companies that book me are seeing the looks that they have in mind when they go through my portfolio. Everyone is extremely impressed with your photography, and every model who has looked at my book wants to know where I got my pictures so they can get some like I have, too. Thank you so much for making a real difference in my modeling career! You made me a believer, and I will send models I know your way." Got Range? Our model photography will help you show your range of looks! These photography sessions are designed to give the professional model quality pictures that demonstrate their range of looks. The pictures are used in professional model marketing tools such as portfolio books, composite cards, and web comps for web sites. Composite card and web comp services are sold separately. Take a look at our model photography portfolio for samples of the model portfolio photography work of our photographers in the Tampa Bay area. The standard model portfolio photography session is packaged at six looks. The six look package is at a reduced rate from what the session would be at our per look rate, and it is an excellent value. We also offer service rates by the look. Contact us for more information. Model portfolio photography services are guaranteed for quality at no risk to you. It is our main goal to give you quality pictures that you can use; pictures that work for you. 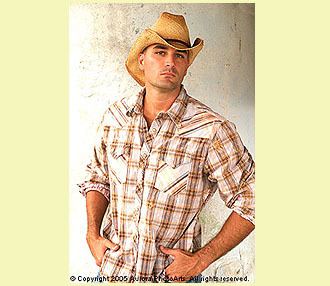 Photograph: Tampa Bay model Mark Robinson, photographed by Tampa Bay photographer C. A. Passinault. Aurora PhotoArts Site V6. VENUS CLASS Web Site by Eos MediaArts. Events by Eventi Events. Videos by Dream Nine Studios. Aurora PhotoArts, a Passinault.Com company. Aurora PhotoArts is a photography services, design, and art production company based in the Tampa Bay area and serving Florida. It is a company of Passinault Industries LLC. Venus Class Web Site by Tampa Bay Advertising Agency Eos MediaArts, a Passinault.Com company. Venus Class 0001, commissioned 073107.0900 hrs. Aurora PhotoArts Tampa Bay photography and design V6 web site template and site directories refreshed on 03/07/08. © Copyright 1994-2008 Aurora PhotoArts. All rights reserved. Unauthorized duplication and use of all images is expressly forbidden. Releases and proof of copyright ownership are on on file at our offices in the Tampa Bay area. Images cannot be licensed or sold without a model release or the appropriate release. Aurora PhotoArts is affiliated with Tampa Bay advertising agency Eos MediaArts, a Passinault.Com company and one of our many sister companies. We often refer our model, actor, and talent clients to advertising agencies for booked model jobs in the Tampa Bay markets as well as other major markets. Talent do not have to be our clients in order to be referred to the advertising agency bookings, as they only need to have professional career tools such as portfolios, composite cards, and head shots in order to be considered. Referred talent may use the professional tools that they have and are not required to book any services from us in order for us to refer them. Aurora PhotoArts allows our clients to bring along a friend or a family member to any service that they book as long as it is not a professional conflict of interest. Clients and models under the age of 21 are encouraged to involve their parents in the consultation, booking, and service process of any of our services that they wish to book. Anyone under the age of 18 is required to have the full participation of their parents or legal guardian. We do not knowingly solicit minors for any service that we offer. We only refer models to top model and talent agencies who have professional clients and who are associated with ethical professionals. Aurora PhotoArts is not affiliated with any model and talent agency or agencies, and our photography and design services company is not represented by any agency. We are not responsible for the opinions and actions of any agencies who we may refer our clients to. Additionally, we recommend that models invest in portfolio pictures and composite cards before going to any agency, as this will avoid any potential professional or ethical conflicts of interest without compromising the integrity or quality of the portfolio pictures and modeling career tools that they need. Aurora PhotoArts Blinder Security enabled. APS Version optimized for photography and design services marketing. Blinder web site security protocols by Tampa Bay advertising agency Eos MediaArts. This web site is used for marketing purposes only and does not include detailed information about our plethora of service lines. We do not post information such as rates on this web site. If you have any questions about our services, would like to set up a free consultation, or would like to know our rates, please contact us by calling our Client Services department today at (813) 671-9507. We would be more than happy to answer your questions over the phone or in person. Exceptional Photography and Design. Exactly what you need. A founding member of the Tampa Photography Society, an association of professional photographers - True integrity, trust, and quality among qualified professionals.